I snagged my 1,000th ball at Shea Stadium in 1996, and I caught #2,000 seven years later in Montreal. At the start of this season, I decided to bring the next milestone back to my hometown–and to get it at Yankee Stadium. I started the day with 2,996 balls. I had a good feeling that I’d get at least four, but there was no guarantee; at my previous 30 Yankee games, I’d snagged more than four only eight times. My dad wanted to be there for the historic snag and offered to be my official photographer. As we rode the subway to the game, I drew him a map of the right field seats, showing him where I expected to be and where he’d get the best shot. As we waited outside the stadium, I showed him how to use my camera. Everything was set. We were first on line. The gates opened at 5pm. I raced inside and didn’t bother stopping to claim my free Yankees visor. Within the first minute, someone jerked a deep fly ball into the empty seats behind me. I was already motoring up the steps by the time it landed, and I grabbed it just before a few other guys got there. I was worried. I had no idea who’d hit the ball. I didn’t want #3,000 to come from a player that I couldn’t identify. If I snagged it with the glove trick, that’d be fine…and in fact I was kind of expecting that…but if the milestone ball was going to be hit or thrown my way, I wanted to know the source. 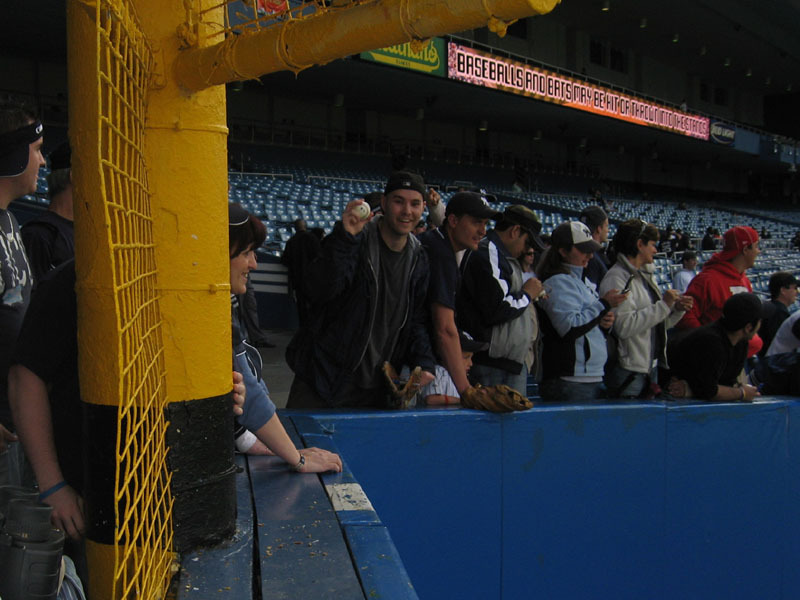 I got my second ball tossed by Yankees pitcher Darrell Rasner, and I quickly got #3 off the bat of Hideki Matsui. He’d hit a homer five feet over my head that landed in a group of fans who couldn’t catch. The ball hit the seats and trickled down the steps toward me. Half a dozen hands clawed furiously for it, and mine was a bit quicker than the rest. This left me with a grand total of 2,999. My God. I really had to pay attention…every pitch, every swing, every stance, every shagger, every coach…there was no telling where the next ball would come from, but sure enough, as I’d predicted, a ball ended up rolling onto the middle of the warning track near the foul pole. My dad and I hurried over. Ball #3,000 was indeed going to come my way via the glove trick, but it wasn’t going to be easy. The ball was nearly 10 feet out from the wall, so I had to lower my glove and fling it out and try to knock the ball back in. I tried again and again. No luck. But at least stadium security stayed away, and so did the players. This ball was just sitting there. 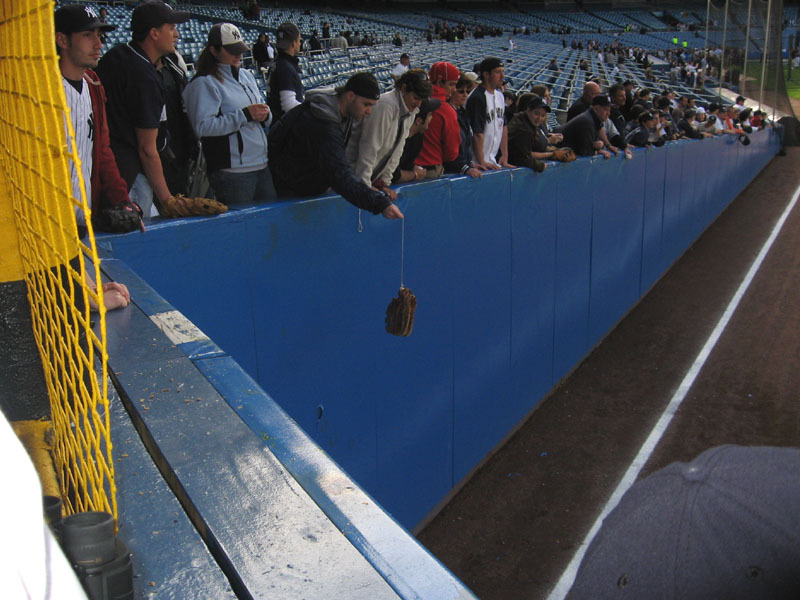 Other fans were getting into it and started giving me advice: Try to make your glove land behind the ball and then drag it in. Yeah, thanks. I didn’t bother explaining that the “drag” technique is usually good for just a few inches at a time. I wanted to GO FOR IT and make the glove land ON the ball. So I kept trying. And cursing. But I knew I could do it. And finally, after two minutes’ worth of failed attempts, I made a perfect toss-and-jerk and knocked the ball all the way to the wall below me. I quickly reeled in my glove and set up the rubber band and magic marker…just like I’d done it hundreds of times…deep breath…nice and easy. I was hoping that my dad was taking pictures. The glove lowered over the ball, and when I lifted the contraption, I had it! Slowly…slowly…I reeled the glove back in, spotted my dad, and gave him a big smile. No celebrating. The journey toward ball #4,000 would be difficult, so I kept snagging. I got my fifth ball of the day in almost the same way. The only difference was that I was in fair territory. My sixth ball was another glove trick success, and #7 was tossed by a Mariners pitcher. I don’t know who. It was a lefty. Might’ve been Eric O’Flaherty, but whatever. He lobbed it high in the air from the warning track. I drifted back into the very crowded main aisle and timed my jump perfectly. 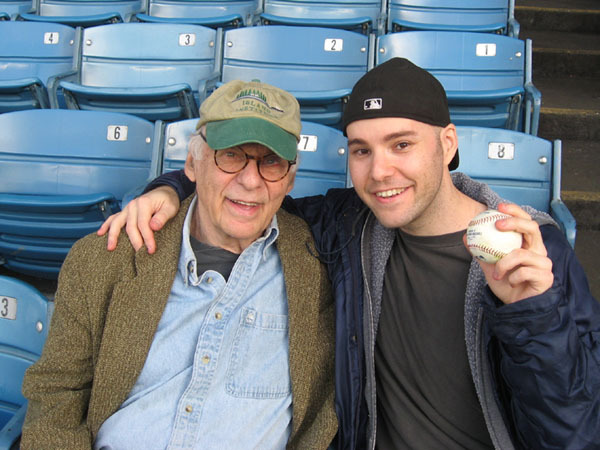 Then I used my Mariners cap to get my next two balls. When Brandon Morrow walked over to pick one up, I basically yelled, “Brandon! Look at my hat!” and he tossed the ball right to me. Toward the end of BP, I used the same line (minus the “Brandon” part) on Mike Goff. Of course, this left me with nine balls, and I was kicking myself for falling short of double digits. “Let it go,” said my dad. I let him go. He had evening plans back in Manhattan, so I walked him to the gate and pointed him toward the subway. It would’ve been nice to spend the game with him, but I knew there’d be other chances, and anyway, mission accomplished. 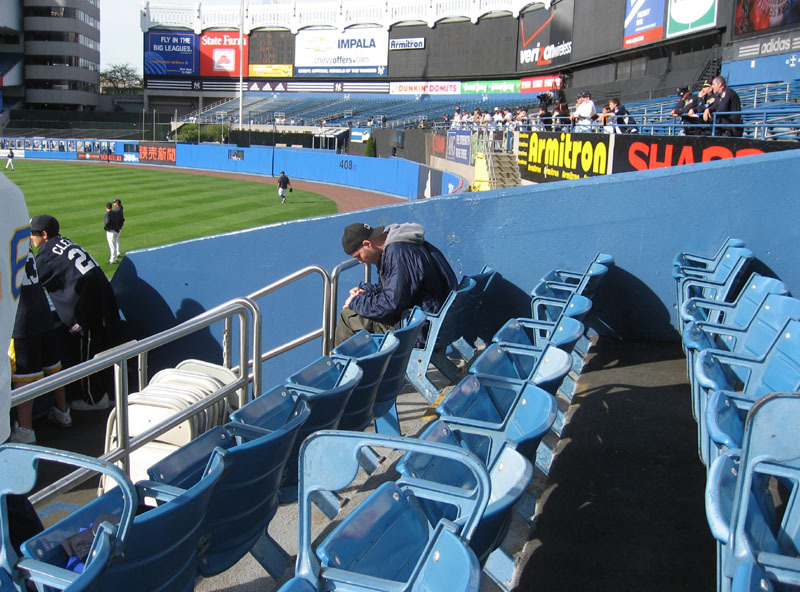 I found a great seat for the game, just to the left side of home plate, right behind the main aisle on the field level. Good spot for foul balls from lefties. (Came close to a few.) Good spot to watch Matt DeSalvo make his major league debut for the Yankees–and he was sharp, giving up just one run on three hits in seven innings. He had to settle for a no-decision when Kyle Farnsworth let the Mariners tie the game at 2-2 in the top of the eighth, and then, one inning later, Mariano Rivera surrendered a solo homer to Adrian Beltre. Final score: Mariners 3, Yankees 2. 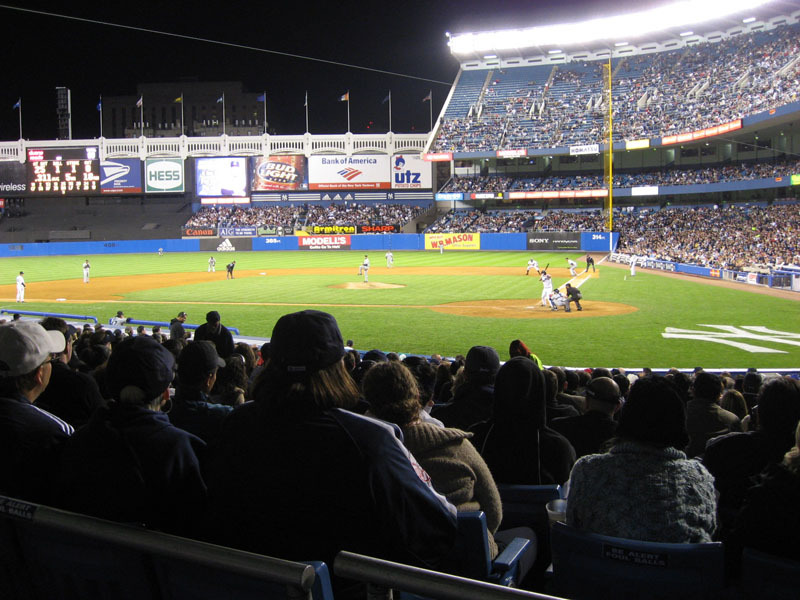 • 10 balls ties my 2nd highest one-day total at Yankee Stadium. • 45 balls in 5 games this season = 9 balls per game. 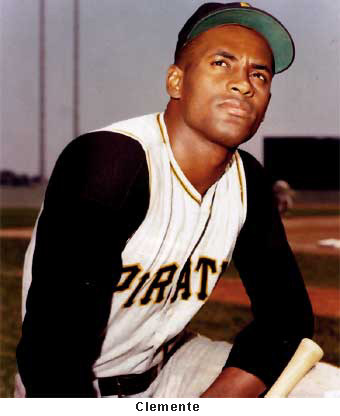 • 3,006 total balls…moves me ahead of Roberto Clemente (3,000) and into 26th place on the all-time hits list. Next up is Al Kaline (3,007). Congrats Zack! I’m not an English major or anything, but I went in and slightly modified your Wikipedia page to reflect the 3,006 ball total. I’m sure someone can modify it even further…. Just got back from the Doctor, I’m sick and probably caught that flipping virus from you over the internet, off my keyboard. I will soon be taking my medication of Amoxicillin to get rid of this nasty bacterial infection. Sounds like you had a great time with your dad at the Yankees game. How did Ichiro play? 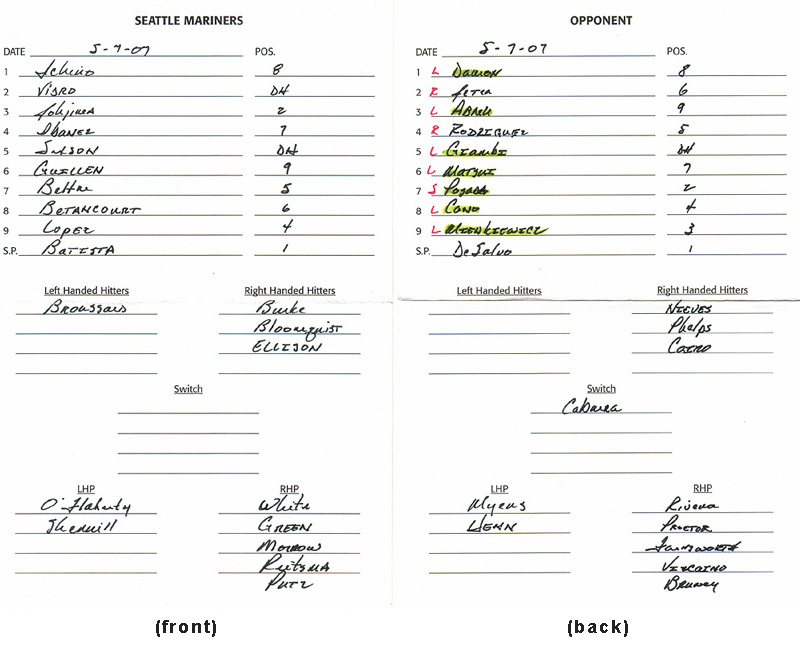 What’s your secret on getting those lineup cards? You know how tight security is by the dugout. Congrats, Mr. Z!!!! Sorry I could not be there, but we shall meet again!!! Ha Ha!!! Congratulations on a wonderful miletsone. 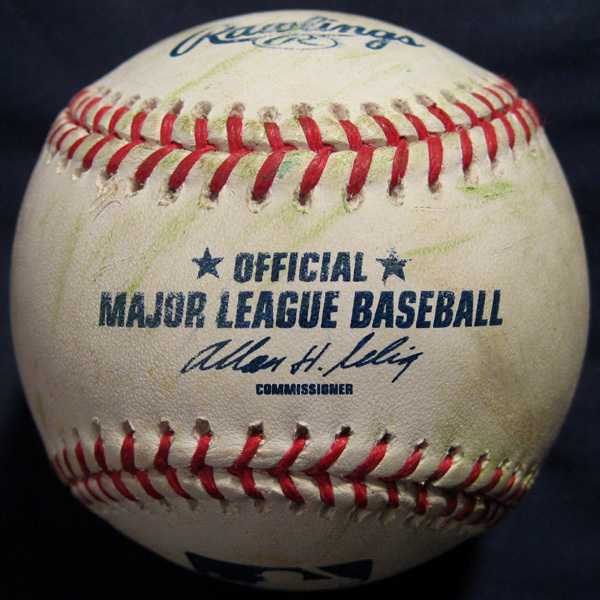 So what’s your favorite ball among the following: your 3000th overall ball, your 100th game ball, or the Barry Bonds’ 724th home run ball? Man, I’ve been a Mariners season ticket holder for four years and I can’t get those guys to give me ANYTHING. So I too am wondering how the **** you get lineup cards. Okay, so on the lefty pitcher — if you would have recognized Jarrod Washburn (who almost always completely ignores fans anyway), then it leaves Eric O’Flaherty and George Sherrill. Sherrill’s kinda pudgy, 30 years old, has a shaved head, and almost always wears a sweatshirt before the game rather than his uniform shirt. O’Flaherty’s a kid and really LOOKS like a kid, he has short brown hair though, unlike Sherrill. They’re both really nice guys though, so I could imagine either of them throwing you a ball. Oh yeah, Brandon Morrow is also awesome, nice job there — he was our #1 draft pick in 2006, so he should be around a loooong time, I hope. Wow! Congrats man! This is all so awesome! Ball 3K, are we gonna read about your 4000th in, say 2012? Did u get a chance to see how that ball rolled by and who it was hit by before u snatched it. Anyway im going to see the D-Rays on Saturday and hopefully I can get a Kazmir auto as he is one of my top players, *** as I am typing this the Jays just gave up a 3 run homer to Lowell, GAH and now Varitek jus hit one as I typed the Lowell homer. DAMMMM! Don’t worry, you’re not jinxed, and yeah, I deleted the comments. I can understand your exceitment about being the first one to hear the news, but I wanted to be the one to reveal it to everyone here on the blog. Hope you did well tonight. I’m looking forward to hearing about it. Cool, thanks for making the update on Wikipedia…and thanks for sending the link to that Vernon Wells story. That’s insane! Yeah, it sure was a great time, but I’m sorry to hear you’re sick. Ichiro played well, going 1-for-3 with a double, a walk, and a run scored. As for the lineup cards, I just asked (yelled at) Mike Hargrove as he was walking off the field. I appreciate it, and good question. The Bonds ball is BY FAR my favorite. I’ve been looking at Jarrod’s mug since he played for the Boise Hawks in 1995, so let me ask you about O’Flaherty: Does he have small dark sideburns? I didn’t know Morrow was such a prospect. Cool. And thanks. Oh, and as for the lineup cards, it’s just a matter of getting down behind the dugout and then begging the manager for them as soon as the game ends. Thank you! 2012 sounds about right, actually. No, unfortunately, I have no idea how the ball ended up there. Sorry your Jays are struggling. Was that your 1st pair of linup cards in NYC?? Its fitting that you got 3k w/ the glove trick because without the glove trick you would still b near 2500. I did do well 2nite, so im not jinxed. Yeah, I figured you’d recognize J-Rod the Washburninator by now. And yeah, it sure sounds like only the away manager would give them away. There’s no way to even get near the home dugout in Safeco, tons of people swarm it, and even so it’s a terrible angle to ask for anything, and ushers stand on top of it and tell fans to go away. I’m betting Safeco’s an awful place to snag baseballs, too. Congratulations on your 3000th ball Zack! I’m happy that it came at a special place and with your dad. I’m excited to read about your 3rd season on MLBlogs. Keep up the Snagging and Blogging! zack-congrats on the 3000th ball!! i really like reading about how you get all of the balls. I had a feeling you would say that about the Bonds ball. I’m going to Shea on Friday night and Sunday afternoon. Should be cool to see the red-hot Brewers and hopefully I’ll get a bunch of balls from them. It actually wasn’t a “pair” of lineup cards. It’s just one card, which I’ve shown front and back, but yeah, this is the first one I’ve ever gotten in New York City. I’m glad you had a good night and got a few balls. Keeping the string from getting tangled is always a challenge. Sometimes, I uncoil all the string after each use and then coil it back neatly. It takes a minute, but it’s worth it. Senior cut day! Awesome! You should definitely see some baseball that day. As for highlighting balls in red, I only did it on that Camden entry because there were so many balls, and I didn’t want people to get confused. I think it looked cool, but the problem, I realized when I read it myself, was that the red was so catchy that my eyes skipped ahead, and I saw the red too soon and lost all the suspense by knowing that another ball was coming up. Yeah, that’s really all there is to it. Most managers will ignore you, but occasionally you’ll get lucky. Nice pics, but I’m still not sure which player it was. Darn. I guess that ball will go down in history in that awful “unknown” category. Thanks very much. I’m happy with how it all turned out. Thank you, too. I’m glad you’re enjoying the blog. Sunday afternoon? Uh oh. That might be tough. Good luck. No Monday game for you? I’m planning to be there for the first game of that Cubs series.